ADA Handicap Parking Lot Ramp Installation - Parking Lot Services of FL. Just about every commercial or public building in the greater Tampa Bay area requires a handicap parking lot ramp. PLS is here to install these highly specialized ramps to suit the nuances of your particular building and property. 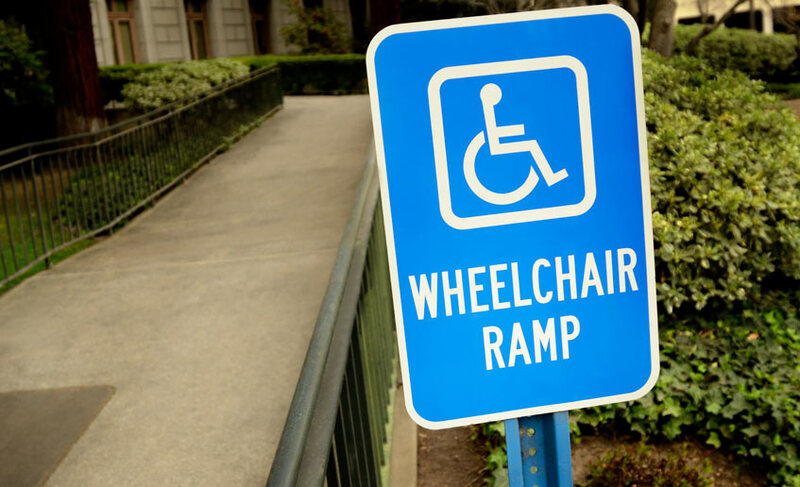 If your organization provides services to anyone who suffers from a physical impairment, you can benefit from a handicap parking lot ramp. Let PLS install a wheelchair ramp that meets the nuanced dimensions of your property. As long as you have enough space, our team will install a high-quality handicap parking lot ramp that stand the test of time. This is exactly what your business needs to welcome those who require wheelchair transportation, crutches, canes or another means of assistance aside from stairs when entering your building. Almost every single business in Tampa Bay will require a wheelchair ramp. Such a ramp will boost accessibility, empowering the physically disabled to enter your facility without any encumbrance. However, businesses are only the tip of the iceberg when it comes to ADA parking lot ramps. Organizations ranging from libraries to churches, schools and other public buildings also require ramps to ameliorate visitor access. The addition of such a ramp will also serve to reduce the amount of traffic that goes in and out of the primary doors as those with mobility challenges will enjoy their own private entrance. Think of how nice it will be to eliminate those bottlenecks that occur when an individual in a wheelchair is attempting to enter your building. A ramp will free up ample space so customer traffic can flow in and out, unimpeded. PLS is the cream of the crop when it comes to creating and installing durable ADA parking lot ramps. Our professionals have been perfecting the design and installation of these structures for years. You can trust our team to study your property’s idiosyncrasies before jumping into the actual installation. Our team will assess your unique situation to ensure that ramp will fit, then customize a solution that is perfect for your space. PLS will also create pavement striping for your parking lot. It is quite possible that the installation of a wheelchair ramp will cover your existing striping. You can lean on our team to re-stripe the property to prevent traffic flow problems. We will make sure that drivers aren’t confused as to where they should drive and how to enter/exit your property. PLS has been improving parking lots throughout the greater Tampa Bay area for more than 50 years. We can even service other areas throughout central Florida. PLS does business with business owners, residents, public organizations and just about any other party. Aside from handicap ramp installations, we also perform wide assortment of parking lot services including striping, seal coating, general parking lot repair, parking lot maintenance, asphalt paving and asphalt patching. Parking Lot Services is a full service parking area maintenance company. We provide the expertise, knowledge and high-grade, professional equipment and staff to help you maintain your investment and ensure the best looking and safe parking areas on your property.